This is me, Kaye, and I poured my heart out on this page for my family & to whomever visits it. a dear friend from Glennas Garden! to help me complete this page! Welcome to my pages that contain some of the poems I have written. I hope that one will touch your heart & give you some kind of comfort. I ask you to take time to read them, to sign my guestbook so I can know you came by, & to visit the sites that are linked from my pages. Thanks & come back anytime. I can't create this page without giving tribute to my parents. My dad lost a battle with lung cancer,& now, my mom is fighting a battle with colon cancer! I thank God for them both! for others have tried and failed..
and he'll just follow an empty trail! It won't win without a fight! to struggle with all of his might! once his eyes have closed in death. that he fights to his final breath! to win in this Cancer Battlefield! "My Mom is a Survivor"
He cries when noone's around. 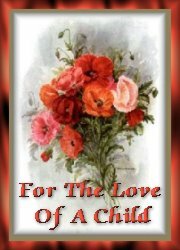 Dedicated to the dads who have lost a child. when you need to unwind. No where else will you find! "Jewels" that'll bring your heart anywhere it wants to be led! will welcome you with a smile! you'll be laughing after a while! when you simply need a friend! and exactly what cancer demands! are surely one of a kind! when I must leave them behind! and then I saw a bright Light! and stood right by my side. He said, "For you, my child, I died! and walked the hill called Calvary! as they nailed me to that tree! with a crown of thorns upon my head. but, I chose to die for you instead!" as I listened to my Savior speak. and wiped the tears from my cheek. and I am ALWAYS at your side. remember, for you, my child, I died!" Jesus loves me & will never leave me! but ask the reason "why?".. that no words can explain! but the next day, he's gone! Yet you feel lost and alone! just like a two-edged knife! with God hand in hand! to this cruel worldly place! as he'd wipe the tears from your face! that he walks on streets made of gold! To stop the flow of your tears! who has lost a loved one! IF you would like to be considered for this award, please send me a link to your page. Thanks. If you would like to be considered for this award, please send me a link to your page. This award is in honor of the moms & dads who have lost a precious child. JUST A FEW OF THE MANY PAGES THAT TOUCHED MY HEART! All of the poems and graphics on my pages are copyrighted by me or others. Please do not use the poems without written permission. 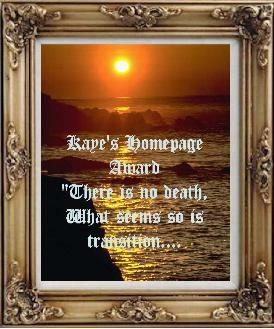 Disclaimer and Copyright � Kaye Des'Ormeaux 1990-2001 - All Rights Reserved. You may use this graphics to link back to my site if I have written a poem for you or your loved one. 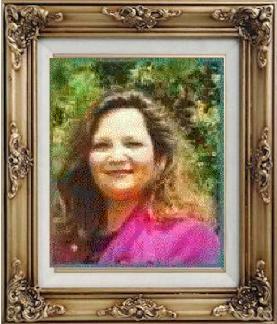 ~ My sister Linda M. Dagleish who was an Organ and Tissue Donor.